I have to admit, I wasn’t sure what I was getting into with this movie. While I hadn’t seen it before, I have seen The Werewolf of Washington, which was just plain stupid. So I was pleasantly surprised - I really enjoyed this movie. 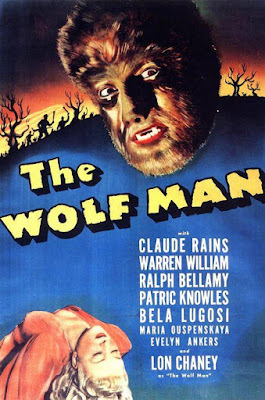 There were a lot of big names in this one: Claude Rains, Lon Chaney Jr., Ralph Bellamy, Bela Lugosi. And as a refreshing change, we’re introduced to them all during the opening credits - a quick clip from the movie with a label to name them. It made it a lot easier to keep the characters straight. The story begins with Larry Talbot (Lon Chaney), returning to the family estate after the death of his older brother during a hunting accident. In the grand scheme of things it doesn’t really matter why he’s been gone for 18 years or what he’s been doing, what matters is that his father, Sir John Talbot (Claude Rains), is happy to see him and wants them to be closer. To that end, Larry helps him finish building a telescope up in the new observatory. The first thing Larry observes is the nearby village, specifically, a pretty girl primping in her room over a shop. Not wasting any time, he goes to the shop where she’s a clerk and asks to see some earrings, describing the ones on her dresser. That’s not creepy at all (said with sarcasm). He ends up buying a cane that’s topped with a silver wolf’s head and she recites the werewolf rhyme for him. He finally leaves, insisting that he’s coming back later to go for a walk with her, and a group of gypsies pass by on their way to set up camp. Later the girl, named Gwen, waits outside the shop for him, wearing the earrings he liked. Joke’s on him because she has a girlfriend with her. They're going to the gypsies to have their fortunes told. The trio walk through the dark woods where the wolfbane is growing and Jenny (the friend) goes in first to have her fortune read by Bela (Bela Lugosi). Larry and Gwen go for a walk in the fog and he admits to spying on her through the telescope. She’s not impressed (but not creeped out by it either), and tells him she’s engaged. Meanwhile, Bela is not happy about whatever he sees in the cards for Jenny. As he brushes his hair out of his eyes we see a pentagram mark on his forehead, and then we see the same mark on Jenny’s hand. He tells her to run away, and she does. Outside of the wagon a black horse pulls at its tether. A wolf begins to howl. A woman screams. Larry ditches Gwen to run to Jenny’s aid. She’s being savaged by a wolf and he starts beating on it with his walking stick. The wolf turns on him but he beats it off. Gwen arrives on the scene to find Larry barely conscious. An old gypsy woman from the camp - who just happens to be passing by with her horse and cart - helps Gwen get Larry home. A group of men - including gamekeeper Frank (Gwen’s fiancé), Colonal Montford (an old friend of Larry’s who’s now the police chief), and Dr. Lloyd (a friend of his father’s) - find Jenny, her throat torn out, and nearby is Bela, whose head has been bashed in. Larry’s cane is found close at hand. Next morning Larry wakes up in bed, a little confused and a whole lot frightened. His father, the Colonel, and the doctor pay him a visit. Larry identifies the walking stick as his, and tells them he used it to kill the wolf. But although the clothes he wore the night before are torn and bloody, there’s no sign of the wolf bite on him nor were they able to find the wolf. Larry is even more confused and frightened. Gwen’s pretty upset over her friend’s death, and she’s in the backroom of her father’s store when Jenny’s mother enters with a few of her cronies and starts mouthing off. Enter Larry, who chases them off and tries to comfort Gwen. Enter Frank, Gwen’s fiancé, who doesn’t seem to like Larry much. Gee, I wonder why? Now it’s later that evening and the gypsies are holding some kind of a carnival at their camp. Frank and Gwen are there having a good time. Larry’s there too, only not quite as happy as everyone else. There’s a lot of music and dancing and general merriment. 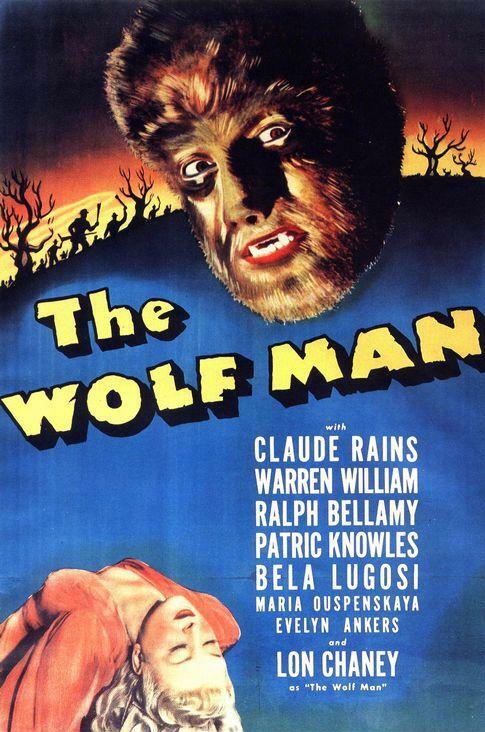 Larry crosses paths with the old gypsy woman who tells him that he killed the wolf and the wolf was her son Bela. She also tells him the wolf can only be killed by silver and “whoever is bitten by a werewolf and lives will become a werewolf themselves”. She gives him a pentagram charm to wear for protection. Larry leaves, then the old woman comes out of her tent and whispers to another gypsy, who whispers to another, and whatever’s being said spreads like wildfire. Larry runs into Gwen, and tells her about the old woman and how she said he’s a werewolf now and gives her the charm. Next thing you know, the gypsies are packing up and leaving. Gwen leaves on her own and Larry has a mini melt down. He thinks he’s becoming unhinged and doesn’t know what to believe. Back home he strips off his shirt and is relieved to see he’s not sprouting any extra hair. But then he takes off his shoes and we see his legs and feet are getting really hairy. Now we have a completely transformed Larry wandering through the foggy grave yard. He attacks and kills the grave digger. Wolf howls wake up the villagers and some men go to the grave yard and find the man with his throat torn out. Larry wakes up sprawled on his back across his bed. There’s a pentagram tattoo on his chest and he’s horrified when he sees the animal prints leading from the window to the bed. Clearly he’s having some kind of mental breakdown, which is why his father disregards his concerns about werewolves. Off they go to church together but Larry doesn’t stay. When he arrives home, his father and their friends are discussing the wolf problem. Larry insists it’s not just a wolf, it’s a werewolf. That night, Larry (in werewolf form) is caught in one of the wolf traps. When he hears Frank and the other hunters he struggles until he passes out. The old gypsy woman finds him and he turns human again. Freeing himself from the trap, he wanders barefoot into the village to talk to Gwen. He tells her he’s going away, and even though he’s positive he’s the killer, she wants to go with him. As he holds her hand he sees the pentagram appear and he runs away. He ends up back home where his father tells him he’s just suffering from mental stress, brought on by the gypsy woman and her fantastical stories. To prove it’s all in Larry’s head, he ties him to a chair while he goes to help with the wolf hunt. Larry begs him to take the silver headed cane with him and he does. While the hunters lay in wait for the wolf, Sir John crosses paths with the gypsy woman. They’re arguing when they hear shots being fired. The hunters are positive the wolf was hit, but can’t find it. Gwen’s running through the woods looking for Larry and encounters the gypsy. Against the gypsy’s advice, she keeps looking. Of course she runs right into the werewolf, who attacks her. Sir John is the first one to the rescue and hits the werewolf with the cane to get him away from Gwen. The monster then turns on him and he keeps beating it, in self defense. Then Sir John watches, horrified, as the gypsy woman speaks her blessing over the beast’s body and it transforms back into his son. She drives off in her cart and the others come running up. The Colonel takes charge and it’s decided that the wolf attacked Gwen and Larry died defending her. Well done Larry. At first I thought Lon Chaney’s portrayal of Larry was a little over the top, but actually, it helped show the mental breakdown of the character. You begin to wonder yourself if there really is a werewolf or if it’s all in his head. This movie really is a classic. The only version of this movie I could find on YouTube is pretty dark, but if you can lighten up your screen this would be the perfect movie to watch while you’re passing out Halloween candy.